Hello fellow cardsmiths, we were really disappointed to close our last flavor text challenge. But it didn't receive the amount of entries we'd hoped to start with. As such, we thought we'd change the formula to account for less entries. Because we'd like to still run a flavor text challenge, we're gonna make a combined list of rules from Creature Feature and Post your cards here. Actually see what others think. Of which, you should check those threads out! 1) I will favorite all cards posted that are appropriate for the forums and mtgcardsmith. I'll also gift a premium subscription to one of the first five entraints. After a week's time-frame, if we get that many entries in that time period. This will be as a thank you for getting the challenge rolling! 1) You will make a card using one of the flavor text options given by the cardsmith prior to you. 2) You will post up to two sets of flavor text for the next cardsmith to choose from. 3) This process will repeat for as long as there is interest in it. 4) Cards must be appropriate for the forums and mtgcardsmith. If you post an entry and another cardsmith has already posted a reply, your entry will still be accepted. Just don't request flavor text. "You never grew beyond your days in the flask. Did you truly think you'd become superior to humans by removing your seven desires?" To bump this challenge, we'll post a different song every few days. Ah, some good ol' FMA to start us off, I see. I've got a card right here. 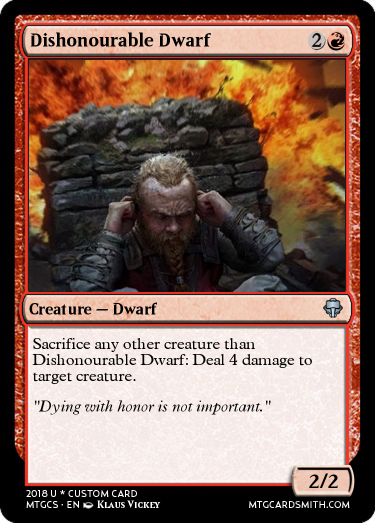 It's a little forced, but I really wanted to do something with art of the Dwarf in the Flask. Next flavor text: If only they'd known that things could, and would, be much, much worse. Since I chose not to bump this thread for a few days, I'm going to bump this thread daily with music for a while. 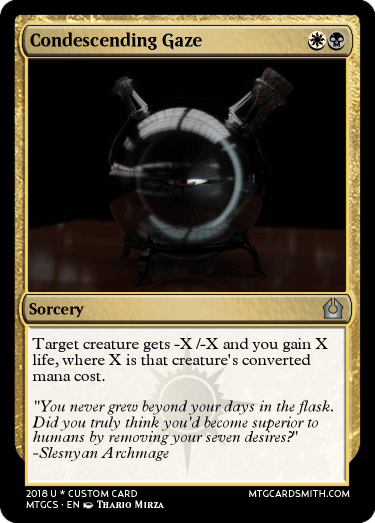 @Lujikul, nice flavor text! Just changed a couple words to make the card more coherent and natural sounding. Why savor the moment when you can savor them all? Love the flavor text, and it seemed to fit one of my favorite MTG characters pretty well. Next flavor text: For the first time in 100 years, he wept. Alternative: When the dust settled, all that was left was a ravaged city, a sea of corpses, and a lingering sense of regret. 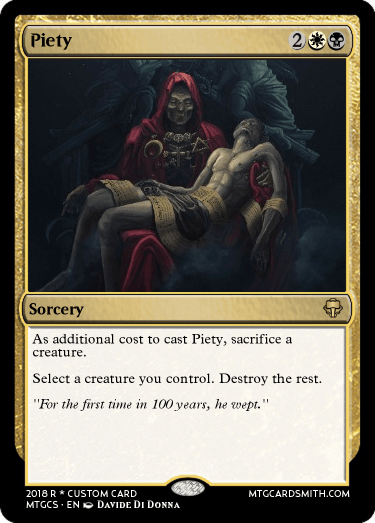 Next flavor text: "My strongest regret is not having (him/her) at my side"
Alternative: "Dying with honor is not important"
Next flavor text: "We didn't need that anyway. Did we?" Alternative: "Is that a dragon or a thopter?"